Almost a quarter of a century after the character’s first emergence, Jason Voorhees remains a famous movie murderer, as documented through 11 different movies. (Or 10 if you want to nit-pick, since he wasn’t the villain in the first flick.) 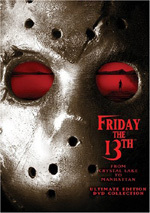 Though previously released individually, the first eight movies get a reworking as part of a five-disc package entitled From Crystal Lake to Manhattan - Ultimate Edition DVD Collection. For full information on the individual movies, please consult my separate reviews via the links above. Please note that the picture and sound grades found at the top of this article represent an average for the eight movies. Though this article covers the boxed set as a whole, here I want to concentrate mainly on the package’s fifth DVD. Called “Killer Extras”, this disc includes a wealth of Friday information. The biggest attraction comes from an eight-part documentary called The Friday the 13th Chronicles. As one might expect, this program devotes one chapter to each Friday in the set; it runs a total of one hour, 43 minutes and 15 seconds. It consists of movie snippets, behind the scenes materials, and interviews. We find remarks from producer/director Sean Cunningham, actors Adrienne King, Betsy Palmer, Ari Lehman, Amy Steel Pulitzer, Warrington Gillette, Larry Zerner, Corey Feldman, CJ Graham, Kane Hodder, and Lar Park Lincoln, special makeup effects creator Tom Savini, director of photography Gerald Feil, director Joseph Zito, director/writer Tom McLoughlin, director John Carl Buechler, and director/writer Rob Hedden. For the first film, we learn about the origins of the series and the first film’s development, the concept behind it, casting, its pacing and gore, the score, shooting the climax, the misdirection ending, and the flick’s success. Part 2 follows potential concepts for the sequel, casting, stunts and filming details, and Jason’s look. As we go through Part 3, we hear about its use of 3-D and related issues, and the introduction of the hockey mask. For The Final Chapter, the program covers new ideas, casting, creating some of the kill scenes, and shooting the end sequence. When we look at Part V, we learn about its concept, filming the opening, and Feldman’s wishes for a sequel. Part VI gets into its origins, casting another Jason, shooting some of his scenes, its humor and references, studio reactions and added kills. In the section devoted to Part VII, we hear of casting yet another new Jason, the character’s new physical redesign, locations and production notes, and stunts. 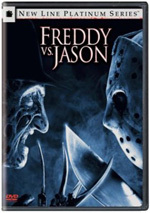 Finally, Part VIII gets into the influence of the Friday TV series and how Hedden got the job, initial talks for a joint effort with the Nightmare on Elm Street gang, taking Jason away from Crystal Lake, story concepts and changes, shooting in New York and also faking it, filming the boat sequences, flashback scenes, humor, and some kill scenes. The quality of each separate chapter totally depends on the personnel involved. Some of them include limited points of view, a problem that becomes most extreme with Part IV. Director Zito tosses out some quick notes about why he left Final Chapter open-ended but mostly we just hear Corey Feldman chat about his experiences on the set. Since he leaves the film after only about five minutes and we hear nothing about the rest of the movie, this makes it a very incomplete program. The discussions of parts III and VIII probably stand as the best of the bunch. The latter is definitely the most detailed, while the former presents nice notes about the use of 3-D. The chapter devoted to the first film also has many interesting elements, but it seems rather incomplete given the significance of that particular film. I feel the same way about Chronicles as a whole - it has many very good moments and offers nice general insights but it comes across as a choppy and scattershot history of the series. Next we find a collection of featurettes entitled Secrets Galore Behind the Gore. It splits into three parts, one each devoted to the elements of the first film, Final Chapter and Part VII. All together, they fill 34 minutes and eights seconds. We hear from makeup effects creator Tom Savini, director/producer Sean Cunningham, makeup effects school instructor Chris Pirt, students Danielle Noe, Anthony Ortiz and Robert Lucas, actor Kane Hodder, and director/makeup effects creator John Carl Buechler. As one might expect, the featurettes mainly concentrate on the nuts and bolts elements of creating the visual effects. They do a fine job of that, as the personnel lead us through the pieces and let us know how they did the work. We also get some notes about maximizing the suspense, and Savini takes us on a tour of his makeup effects school. All three segments add up to a fun and informative whole. Among others, various actors pop up in Crystal Lake Victims Tell All! This 15-minute and 35-second featurette includes remarks from Savini, Zito, Adrienne King (the first movie), Amy Steel Pulitzer (Part 2), Larry Zerner (Part 3), Corey Feldman (Final Chapter and Part V), Lar Park Lincoln and William Butler (Part VII, They cover casting, actor reactions to the various forms of death, the rigors of the shooting schedule, and various production anecdotes. The program doesn’t go into much depth, but it offers a pretty lively and entertaining glimpse at what it’s like to act in a Friday movie. Examples of excised footage appear during Tales from the Cutting Room Floor. The 17-minute and 12-second program includes a mix of removed, alternate or extended bits. Three pieces from the first movie offer split-screen comparisons of the final footage with longer gore shots. Part IV presents an extended scene in which Tommy shows off more of his gruesome toys as well as two deleted bits that slightly expand the characters. For Part VI, we see seven more split-screen comparisons of the original cut and the final version; most were slightly edited to remove explicit elements. Part VII gives us 10 segments for which they pared down the gore, and we also watch a short moment intended for the ending. Buechler and Hodder comment on the sequences; in particular, Buechler seems very happy to present them. Overall, this section provides a pretty nice look at the unused footage. For the final featurette, we go to Friday Artifacts and Collectibles. It fills seven minutes writer/director Rob Hedden, writer/director Tom McLoughlin, director John Carl Buechler, actors William Butler and Warrington Gilette, NECA associate designer Nicolle Puzzo, and fan Brooks Burton. The last dude shows us his custom-patterned Jason guitar, while Puzzon gives us a quick tour of some Friday merchandise. Otherwise, we find a fun glimpse of various props, including the original design for one dead character who reappears at the end of Part VII. Lastly, we get a collection of original trailers. This area presents full theatrical trailers for all eight movies except Part VI. For it, we only find a teaser trailer. Note that as usual for Paramount DVDs, all the extras other than the trailers include subtitles. Here we get text in English, Spanish and French. Love them or hate them, the Friday the 13th movies have clearly become part of the culture. Over the last 25 years, we’ve seen Jason kill and kill again, and From Crystal Lake to Manhattan - Ultimate Edition DVD Collection offers a decent look at the series. With four separate audio commentaries over eight movies, a multi-part documentary, deleted scenes and other bits, the package doesn’t quite live up to its billing as the “Ultimate” set, but it provides a reasonable amount of information. For Friday fans who don’t own already own the movies on DVD, the Ultimate Edition is a steal. It presents the first eight flicks well, and even if you pay full retail for the package, you’ll only shell out $10 a film. Considering that the earlier movie-only versions of the Friday movies list for $15 each, the new release comes at a good price. If you want all eight movies, that is. If you only desire a few, or if you already own some of them, matters become more complicated. Really, the decision will depend on your willingness to shell out again for some items you previously purchased. Some dedicated fans will already have all of them but will consider the Ultimate Edition for its extras. If you’re a real diehard, it’ll probably be worth it for that factor, but I don’t think the set is packed with enough supplements to definitely warrant a “double dip”. This box is best for fans who don’t have any of the Friday movies on DVD, as it doesn’t offer enough to current owners of the prior releases to make it a “must have” for them. It’s a good but not great package.